As part of its commitment to deliver safe, efficient, and cost-effective healthcare to its patients, USACS has put in place an innovative process of quality review. With its rigorous and effective peer review process, USACS clinicians stay current in terms of treatment modalities and changing treatment plans; get updates on new procedures; keep up with advancements in technology and receive constructive crit-icism on a regular basis. The program USACS developed has two major components: in-person peer-review of charts and an anonymous online chart review system. Ultimately, these processes have improved the quality of care delivered in USACS-lead facilities, in addition to reducing unnecessary procedures, reducing costs for the hospital, and mitigating risk. Every two months, USACS providers gather to discuss, review, and evaluate each other’s charts. In many hospitals this kind of peer review is viewed as punitive in nature, but at USACS the goal is to honestly and openly discuss difficult cases with the aim of improving the clinical judgment of every provider. No one is excluded. Each campus has an ED Review Chairman who is responsible for fostering this atmosphere, while USACS’ Chief Peer Review Officer (CPRO) coordinates peer review across all USACS campuses. • Return visits within 72 hours that result in hospital admission, transfer, or death. • Unexpected deaths within 24 hours of admission to the hospital. • Patient complaints significant enough to require review. • Cases referred by other departments, the billing company, or ancillary staff. • Transfers to a higher level of care after hospital admission. Every provider fills out a Peer Review Scorecard, which includes a case summary, room for comments and includes two scores, one rating the standard of care delivered, the other evaluating whether the care delivered contributed to an adverse outcome. Each case is discussed until the providers can arrive at some consensus within the room. USACS’ focus on peer review has resulted in a “Peer Review Top Ten” list of tips to ensure that the standard of care is met and risk mitigated to the greatest extent possible. Working with its practice support partners, USACS developed WebQI, a web-based peer review and quality improvement application. 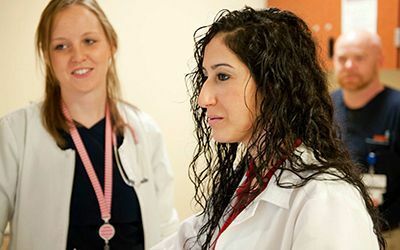 In addition to educating physicians, improving processes and providing a system of accountability, WebQI has been shown to lower costs and improve patient satisfaction. USACS requires that each provider review 60 charts a year. Clinical topics reflect both common and high-risk diagnoses fundamental to the practice of emergency medicine. These topics also complement particular quality or change initiatives that are being undertaken at individual USACS campuses. Charts are randomly and anonymously assigned to physicians and posted to their individual, web-based dashboards for review within 21 days. The short time frame effectively provides real-time feedback, allowing USACS clinicians and department heads to identify trends and outliers very quickly, as well as conduct active risk-management. Beginning with a review of pertinent guidelines, or an updated summary paper, physicians conduct an objective, evidence-based analysis of their assigned charts. Each chart contains a unique scoring template that mirrors the salient points addressed in the clinical guidelines. For example, a template for a patient with pneumonia may have questions pertaining to antibiotic choice, oxygenation status, and other relevant details. In addition to formatted questions, WebQI provides a comments section in which physicians are encouraged to address additional issues, such as legibility and overall tone. Physicians have the option of referring charts to their medical directors in cases where they feel the care provided was substandard or a potential source of litigation. Charts which score poorly are automatically referred to Department Directors and the original clinician, providing each with an opportunity for constructive feedback. USACS providers are encouraged to review their own WebQI- selected charts. Together with the USACS Dashboard, which measures their performance against their peers in the department, WebQI provides effective, real-time peer review. USACS’ Peer Review programs have resulted in significant reduction in utilization across USACS campuses. One WebQI session focused on the need for head CT scans following head injuries. A re-measure of utilization for scans per 100 patients six months after the WebQI review showed a significantly reduced rate. This yielded numerous benefits, including less exposure to radiation for patients, reduced medical costs, decreased length of stay for Emergency Department patients with the diagnosis, and increased patient satisfaction. WebQI has proven that a robust review mechanism for patient encounters, regardless of outcome or complaint has real value for our providers. USACS looks at many more cases than the few where poor outcomes and potential legal issues may have occurred. By regularly reviewing a cross-section of all the charts written by our colleagues, we continuously identify better documentation strategies, develop and disseminate more effective treatment plans, and benefit from a steady diet of constructive criticism. WebQI also encourages providers to produce excellent documentation, an essential tool in reducing the likelihood of successful malpractice suits. This is a valuable benefit that ac-crues to both our providers and our hospital partners. USACS’ online and offline Peer Review processes are a direct result of USACS’ proactive, patient-centered culture of accountability. These tools encourage and enable our physicians to continually improve themselves as clinicians, support the ongoing improvement of the quality of care delivered to patients, and add real value to the service USACS provides to its hospital partners.